Colombia saw a dramatic increase in forest degradation last year and levels in Brazil remain historically high, according to new satellite data released Wednesday. The data from the University of Maryland show tropical forests around the globe lost 15.8 million hectares (39 million acres) of tree cover in 2017—an area the size of Bangladesh. That makes 2017 the second-worst year on record, after 2016, since researchers began gathering the data in 2001. Losses in Brazil, home to most of the Amazon rainforest, made up nearly 30 percent of the total—more than losses in any other single country. "These numbers show an alarming story of the situation for the world's rainforests," Andreas Dahl-Jorgensen, deputy director of Norway's International Climate and Forest Initiative, told reporters when the figures were presented. "It's really a call to action for everyone." This week, Norway is hosting the Oslo Tropical Forest Forum, which will address how protecting forests can contribute to meeting the Paris climate goals. While Colombia's losses were a much smaller proportion of the total, the South American country experienced a worrying jump: Tree cover loss rose 46 percent in 2017 from the previous year, and the number of hectares lost—nearly 425,000—was more than double the average loss from 2001 through 2015. The World Resources Institute, which released the data on its Global Forest Watch platform, linked the increase to the Colombian government's peace deal with FARC rebels, who had severely limited commercial use of large forested areas they controlled for decades. With the rebels no longer in control, land speculators and people who are clearing land for farming, mining and logging have rushed in. Colombian President Juan Manuel Santos acknowledged that the rebels' retreat was partially responsible for deforestation in an interview with The Associated Press on Monday. But he said the government is training security forces to protect the Amazon. During Santos' presidency, protected areas in Colombia expanded threefold. The data released Wednesday measure "tree cover loss," or the death of a tree's leaves. The data might give a more pessimistic picture than other deforestation figures since they don't take into account whether the loss is permanent, while also recording leaf-loss in small areas and capturing forest cover lost to fire. But such data are useful because they can provide a more complete snapshot of disturbances to the world's forests. Many other deforestation figures, for instance, don't count trees lost to fire, which doesn't necessarily result in the permanent loss of a tree, but increases carbon emissions, make trees more vulnerable to future fires and can lead to less biodiversity. 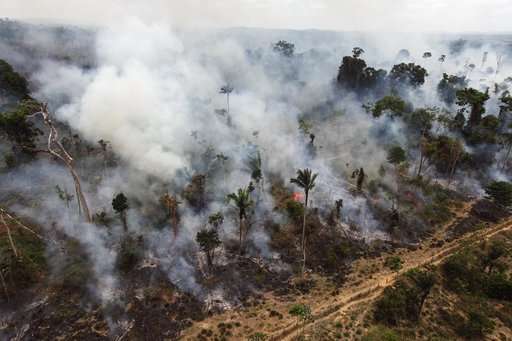 Fires are becoming an increasingly important part of the picture in the Brazilian Amazon, where they accounted for 31 percent of tree cover loss last year, according to the data. "Fires are playing a bigger role and basically bringing carbon emissions back up to the general range where they were when deforestation rates were so high in the early 2000s," said Mikaela Weisse, a research analyst at the World Resources Institute. Fires are increasing partially because of the effects of climate change but the majority are set by people clearing land for other uses, Weisse said. A lack of enforcement of bans on setting fires and other forest destruction as well as a rollback in environmental protections by Brazilian President Michel Temer's government were likely leading to the increase in human-set fires, experts from the institute said. Brazil's Environment Ministry said it could not immediately comment because it had not reviewed the data. Other data monitoring deforestation in the Brazilian Amazon have noted that destruction appears to be up again after a decrease last year. The most recent data from the nonprofit Institute of Man and the Environment of Amazonia showed that the area deforested in May 2018 was about 70 percent larger compared to the same month a year earlier. The University of Maryland data also looked at the African nation of Congo, where tree cover loss reached a record high last year, and the Caribbean, where hurricanes caused significant losses. While destruction from storms is part of a natural cycle, experts worry that increasingly powerful storms may make it harder for forests to recover. The data had some good news from Indonesia, where tree cover loss in primary forests dropped 60 percent last year. Experts attributed that largely to increased protection of peat areas in that Asian nation.